Lauren Tritton, Lachie Manzelmann and Shane Tritton with Yayas Hot Spot and the Newcastle Mile trophy on Friday night. It wasn’t with the horse most expected, but Shane and Lauren Tritton broke through for a special Newcastle Mile win in dramatic fashion on Friday night. Yayas Hot Spot, the first emergency when fields were released and an $81 Fixed Odds chance, made the most of an inside run with Lachie Manzelmann in the gig to beat Little Rascal by a nose and pacesetter Picard by a half head in 1:54:7. Odds-on favourite, track record-holder and defending champion Majordan galloped at the start and never recovered in the race which was delayed by almost an hour because of a rain-affected track and nearby lightning. The rest of the meeting was abandoned after the group 1 race. 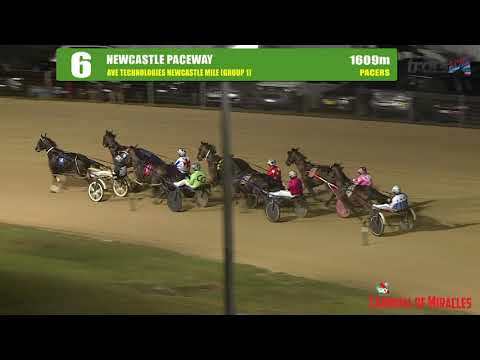 The surprise victory gave the Trittons, who were raised in the Hunter and dominated pacing in the region before moving to Menangle Park three years ago, another group 1 but their first Newcastle Mile title. Yayas Hot Spot earned a start in the $1 million Miracle Mile on March 2 at Menangle with the win. Yayas Hot Spot, now eight, had finished third in the group 3 Newcastle Mile in 2018 and was eighth in 2016. Sydney trainer Kevin Pizzuto was expected to win with Majordan or Picard and the Tritton-trained Maximan was next best in betting. But it was the Adam Sofoulis-owned Yayas Hot Spot, which had barrier two and gained a start after Rakarolla was scratched, that flew late from a sit three back on the pegs. It’s most recent start was a ninth in the Inter Dominion consolation. “It’s definitely a special one, especially for that horse,” Shane Tritton said. The group 1 win was a first for Manzelmann.